Anemia may be making your autoimmune disease worse. There are several different causes and types of anemia. Not all anemia is iron-deficiency anemia. It’s important to know this because you don’t want to supplement with iron if you don’t need it. In excess, iron is more toxic than mercury, lead, or other heavy metals. If you would like to get to the root cause of your autoimmune disease, you can schedule a free 15 minute consultation with Dr. Celaya. Iron-deficiency anemia. This is the most common form of anemia and is caused by insufficient iron. What is less well known is that gluten intolerance and celiac disease can cause iron deficiency anemia. This is because these conditions damage the gut so that it can’t absorb iron. It is also caused by internal bleeding, such as from ulcers. This shows up on a blood test as low iron and low ferritin. B-12 anemia. Like it sounds, this is caused by insufficient B-12. This could be due to a diet low in B-12. You can screen for B-12 deficiency with a urinary methylmalonic acid and serum homocysteine test. Pernicious anemia. Pernicious anemia is an autoimmune disease in which the immune system attacks a compound in the stomach called intrinsic factor, which is necessary to absorb B-12. Many people with autoimmune diseases such as Hashimoto’s also have pernicious anemia. This appears as B-12 anemia. Screening for intrinsic factor and parietal cell antibodies can identify pernicious anemia. Anemia of inflammation or chronic disease. This type of anemia results from the breakdown of red blood cells. You may have symptoms of anemia but serum levels are normal. However, serum ferritin levels are typically high, indicating iron is not being used correctly by the body. Sources of inflammation that can cause this type of anemia are disease, toxicity, infections, gut damage, over training, and more. It’s important to rule this out because taking iron with this kind of anemia can exacerbate the inflammation. Other types of less common types of anemia include aplastic anemia, anemia associated with bone marrow disease, hemolytic anemia, and sickle cell anemia. On the other end of the spectrum from anemia, some people have a genetic disorder that leads them to absorb too much iron. It’s a relatively common condition, affecting about one million people in the United States. Symptoms include joint pain, chronic fatigue, heart flutters, and abdominal pain. If left untreated, it can increase the risk of diabetes, arthritis, liver inflammation (cirrhosis), sexual dysfunction, and other diseases. Hemochromatosis is managed through regular blood draws and a diet that minimizes iron intake. If you would like to get to the root cause of your health problems and look into anemia, you can schedule for a free consultation with Dr. Celaya. 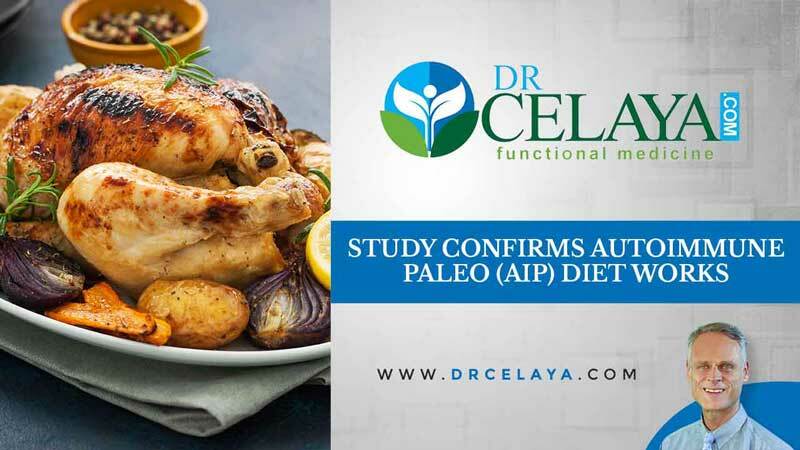 A recent study confirmed what functional medicine has long since known — the autoimmune paleo (AIP) diet is highly successful for managing chronic health disorders. The first-of-its-kind study showed the majority of participants quickly achieved and maintained remission of Crohn’s disease and ulcerative colitis on the AIP diet. A number of participants were even able to discontinue drug therapies. 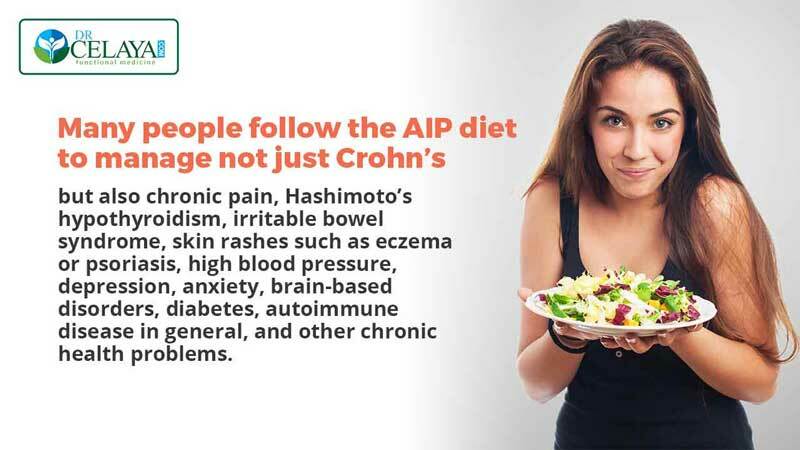 Many people follow the AIP diet to manage not just Crohn’s but also chronic pain, Hashimoto’s hypothyroidism, irritable bowel syndrome, skin rashes such as eczema or psoriasis, high blood pressure, depression, anxiety, brain-based disorders, diabetes, autoimmune disease in general, and other chronic health problems. 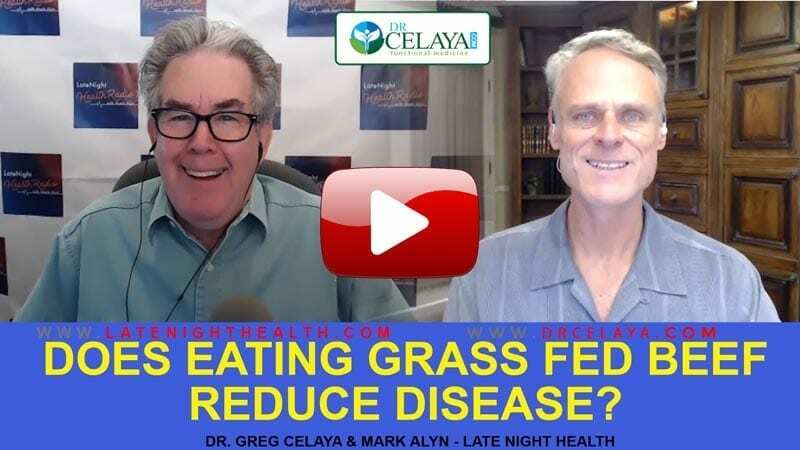 People are surprised to find that not only do their symptoms fade but also they enjoy more energy, better sleep, weight loss, increased libido, less stress, and a general overall improvement of their well being. If you are interested in getting to the bottom of your health issues, schedule for a FREE 15 minute consultation with Dr. Celaya. A primary reason the diet is so effective is because it helps repair leaky gut, a condition in which the lining of the gut becomes inflamed and porous, allowing inflammatory compounds into the bloodstream. 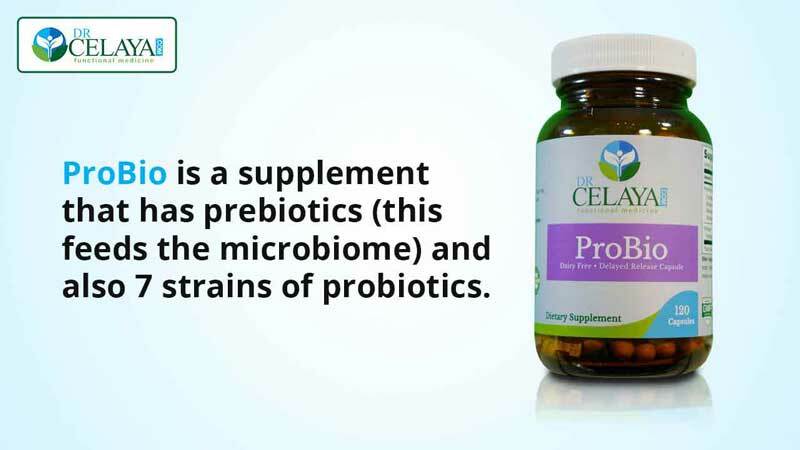 This creates inflammation throughout the body and brain and leads to a wide array of chronic gut, metabolic, and autoimmune disorders. An anti-inflammatory diet focuses on whole foods and is free of inflammatory foods, additives, fillers, and artificial colors. It includes an accompanying protocol of appropriate sleep, physical activity, rest, and positive socialization and self-treatment. Certain nutritional compounds that gently cleanse and detoxify the body may boost the success of the diet. Eliminate all processed foods, fast foods, desserts, coffee drinks, sodas, etc. 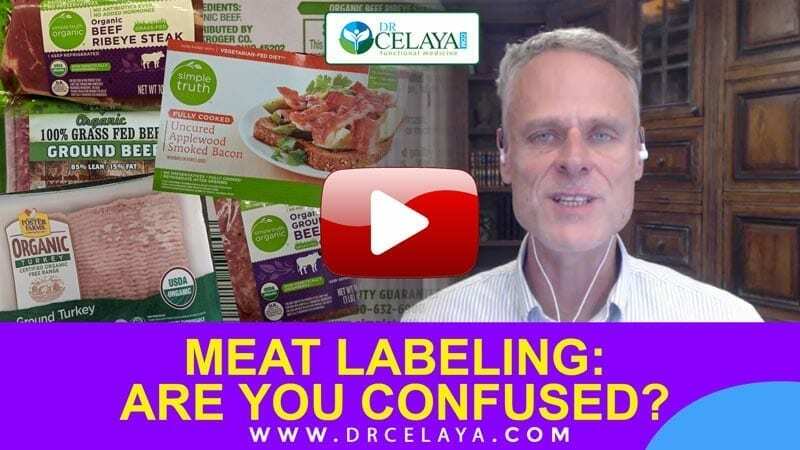 Your anti-inflammatory diet should consist of whole foods found in the produce and meat sections of the grocery store, with an emphasis on plenty of vegetables. Also, eliminate processed vegetable oils and hydrogenated oils and stick with natural oils. 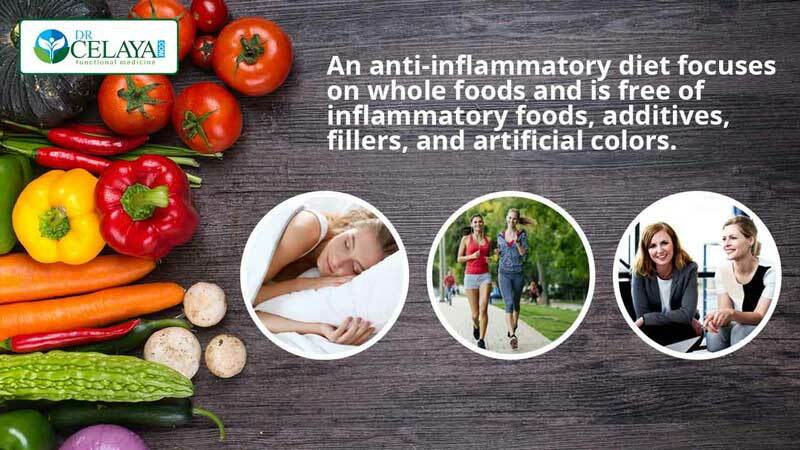 Eliminate common inflammatory foods, the most common culprit being gluten. Many people’s symptoms resolve simply on a gluten-free diet. However, dairy, eggs, soy, nuts, grain, and nightshades are commonly immune reactive as well. Eliminate these foods for about six weeks to see whether you react to reintroducing them one at a time. Eliminate sweets. On the anti-inflammatory diet, you will avoid all sweeteners. This helps curb cravings, stabilize blood sugar, lower inflammation, and lose excess fat. Enjoy low-sugar fruits instead, such as berries. Eat lots of vegetables. Not only do plenty of veggies load you up with vital nutrients and fiber, new research shows they create a healthy gut microbiome – the bacteria in your gut that profoundly influence your immune and brain health. A diet based on veggies creates an abundant and diverse gut microbiome and thus better health. Get enough sleep and exercise. Sufficient sleep is a major inflammation-buster, as is regular physical activity. Overtraining, however, can cause inflammation so watch out for that. Adding in specific nutritional compounds can help repair a damaged gut, lower inflammation, support the liver, and detoxify the system. Want to know more about the AIP diet and your health? Schedule for a FREE 15 minute consultation with Dr. Celaya.